In a new study published in the Journal of Traumatic Stress, researchers say that yoga can be used to bring better mental balance. Yoga has previously been shown as valuable in reducing the stress of university students, and depression, anxiety, alcoholism and PTSD in tsunami survivors, as well as helping cancer patients. The charity Yoga for America runs programs for serving soldiers and war veterans. Agnieszka Golec de Zavala, senior lecturer in psychology at Goldsmiths, University of London, said the benefits of yoga included moving people away from negative thoughts. The beneficial effects are due to the increased ability to focus on breathing that, firstly, focuses a person on a present moment and breaks rumination on negative traumatic thoughts, and secondly, increases ability of ‘intraception’ – observing and understanding internal states and the ability to control them, or understanding them as temporal and passing. But the new study is the first of its kind to provide scientific support for the benefits of yoga’s breathing techniques for PTSD patients in a randomized and controlled (though small) long-term study which monitored effects of yoga over the course of the year. The study focused on the effects of sudarshan kriya yoga, a practice of breathing-based meditation which has a balancing effect on the autonomic nervous system. Twenty-one male veterans who had served in Iraq or Afghanistan, diagnosed with PTSD, were included in the study: 11 undertook a seven-day program involving daily three-hour sessions of sudarshan kriya, including meditation, stretching and group discussion, while 10 others didn’t take part were used as a control group. The soldiers’ PTSD symptoms were assessed one week before the beginning of the program and then a week, a month and a year after its completion. Seven of the 11 involved in the active group continued practicing yoga after completing the program. The study found that the group who had done yoga demonstrated fewer or less intense PTSD symptoms in comparison. Those who took part in the yoga sessions showed lower anxiety and lower respiration rates. They performed better in tests measuring eye-blink and breathing frequency in response to stimuli such as noise bursts, which are used to measure hyper-arousal and how an well individuals are regulating emotions. The researchers also found that the sessions helped with intrusive memories: patients reported re-experiencing trauma during the exercises, but felt that the impact of the memories was reduced. Physical activity causes brain pleasure centres to be stimulated and leads to feelings of wellbeing. Some research studies indicate that regular exercise may be as effective as other treatments like medication to relieve mild PTSD. Generally, exercise has a place in treatment as part of a comprehensive approach to the illness. Serotonin is an important brain chemical that contributes to a range of functions, including sleep cycles, libido, appetite and mood. Serotonin has been linked to mental illnesses like depression and PTSD. Some researchers have found that regular exercise, and the increase in physical fitness that results, alters serotonin levels in the brain and leads to improved mood and feelings of wellbeing. Some research indicates that regular exercise boosts body temperature, which may ease PTSD and depression by influencing the brain chemicals. 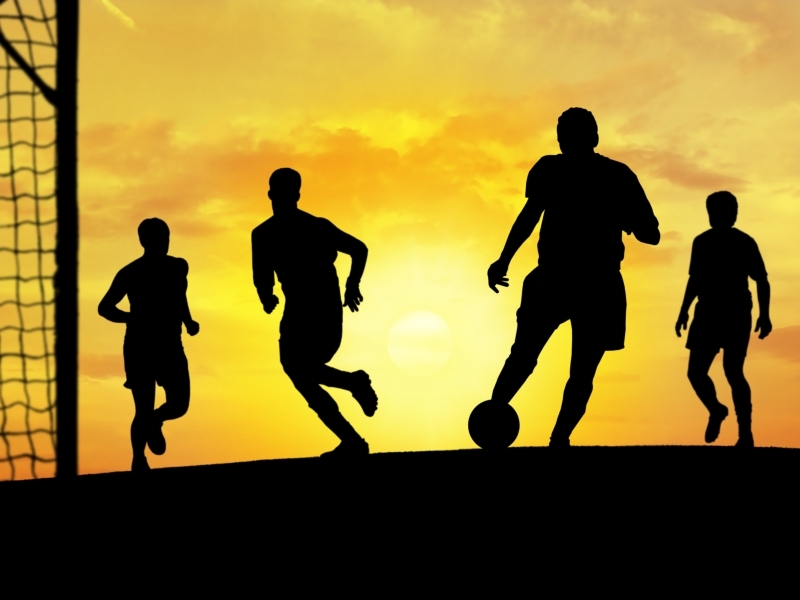 Some forms of exercise, such as team sports, are also social events. 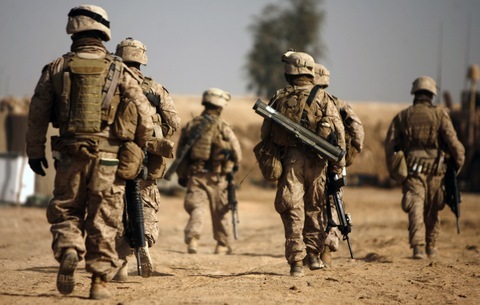 Here at RunFreeFromPTSD we’ve shared how people in the military have a higher possibility of suffering from Post-Traumatic Stress Disorder due to their high exposure to traumatic events. Yet the number of military personnel who seek help and treatment for their PTSD and mental health issues are alarmingly low. So why aren’t military personnel seeking help? This Crikey article outlines how one of the main issues is breaking down the stigma for tough, blokey soldiers so they feel able to discuss combat stress. Thanks to Real Warriors, a campaign that promotes the processes of building resilience, facilitating recovery and supporting reintegration of returning service members, veterans and their families who suffer from PTSD, we have found a comprehensive list of common misconceptions about PTSD and the military. Myth: I cannot get or maintain my security clearance if I am diagnosed with PTSD. Fact: Getting treatment for PTSD is not necessarily a threat to an individual’s security clearance. In fact, mental health counseling can be a positive factor in the clearance process. Army records show that 99.98 percent of cases with psychological concerns obtained/retained their security clearance. Additionally, service members are not required to report some treatments, including those for PTSD, they received due to service in the military when they apply for a security clearance. Factors that could result in clearance refusal include not meeting financial obligations, criminal actions or engaging in activities benefiting a foreign nation. Myth: My military career will end if I am diagnosed with PTSD. Fact: Being diagnosed with PTSD in and of itself does not end your military career. There are plenty of examples where service members have sought treatment for various psychological health concerns, including PTSD, and it did not put their careers in jeopardy. In fact, a failure to seek treatment can lead to a more serious psychological condition, and could eventually prevent someone from carrying out some sensitive tasks. Seeking support to address psychological health concerns shows inner strength and is commonly looked on favorably. Check out these video profiles of some service members who have received treatment for psychological health concerns and continue to fulfill their regular duties in uniform, as well as veterans who sought care and continue to serve the military community as civilians. Myth: Service members only experience PTSD symptoms immediately following combat or a traumatic event. Fact: Symptoms associated with PTSD usually occur within three months after the traumatic event, but symptoms may not appear until six months, or even years later. The types of symptoms can be broken down into four categories: hyperarousal (feeling “keyed up”), avoidance (avoiding reminders of the event), intrusion (reliving the event), and feeling numb or detached. Nightmares, one of the most common symptoms, are experienced by 71-96 percent of those with PTSD. Reaching out for care is an important step since symptoms, such as nightmares, may lessen or disappear and then re-appear later in life. Early intervention can provide the right coping tools to deal with these symptoms, and sometimes even prevent development of chronic PTSD. Visit the National Center for PTSD to learn more about the types of symptoms associated with PTSD. Myth: Service members can never fully recover from PTSD. Fact: Successful treatment and positive outcome are greatly enhanced by early intervention. With therapy, and in some cases medication, the symptoms of PTSD can be greatly reduced, even eliminated. Treatment can help you feel more in control and teach effective coping mechanisms to deal with stressful situations when they arise. There are many types of treatment; your medical provider can help you determine which one is best. You can also contact the DCoE Outreach Center 24/7 at 866-966-1020 where highly trained professionals can answer questions and connect you with local resources for support. Myth: PTSD is a sign of weakness in character. Fact: PTSD is a common human reaction to very traumatic situations. PTSD seems to be due to complex chemical changes in the brain when an individual witnesses or experiences a traumatic event. The symptoms of PTSD appear to be frequently experienced in situations where someone perceives they have been exposed to a life-threatening event, although symptoms and reactions vary from person to person. As a service member dealing with PTSD symptoms, seeking help demonstrates strength and will provide benefits to yourself, your family, your unit, and your service. Do not hesitate to seek care – PTSD is treatable and reaching out early often leads to the best outcomes. Did you know psychiatrists project that 1 in 3 U.S. soldiers will suffer from Post-Traumatic Stress Disorder after serving in Iraq or Afghanistan (or both). People suffering from PTSD are also more likely to commit suicide than those with strong mental health. 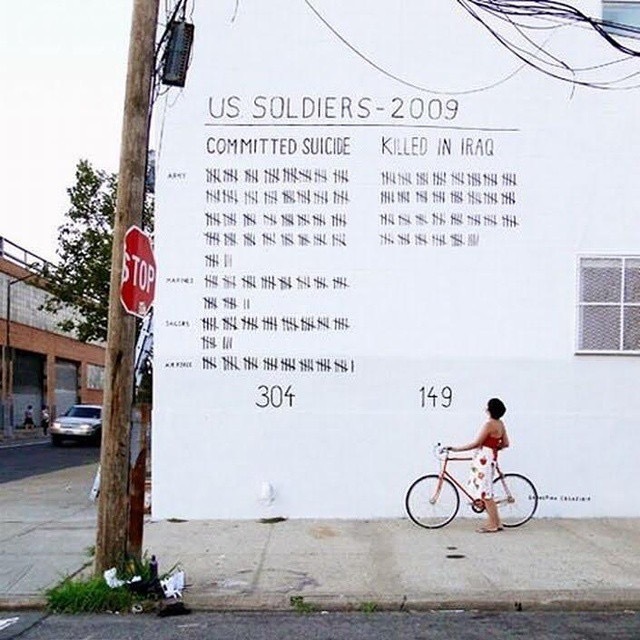 This Banksy piece illustrates why getting medical help for mental illness like PTSD is vital. Help us raise awareness about mental health issues like PTSD so that sufferers know where to get help. Anyone can develop PTSD following a traumatic event, but people are at greater risk if the event involved deliberate harm such as physical or sexual assault or they have had repeated traumatic experiences such as childhood sexual abuse or living in a war zone. Certain jobs like being in the military or police force also pose greater risk of developing PTSD. Apart from the event itself, risk factors for developing PTSD include a past history of trauma or previous mental health problems, as well as ongoing stressful life events after the trauma and an absence of social supports. According to beyond blue, around 1 million Australians experience PTSD in any one year, and 12 per cent of Australians will experience PTSD in their lifetime. Serious accidents are one of the leading causes of PTSD in Australia. Women are more likely to experience sexual assault. Sexual assault is more likely to cause PTSD than many other events. Women may be more likely to blame themselves for trauma experiences than men. According to Army.gov, of the 30,325 current full-time Australian Army members it is estimated that that approximately 18,800 have had operational service and therefore two percent or about 375 will have developed PTSD. Remember if you think you have PTSD please seek the help of a mental health professional. There is a variety of ways to screen for Post Traumatic Stress Disorder and if you think you are suffering from PTSD we recommend you see your GP immediately. Below is a short screening scale for PTSD*, defined by the fourth edition of the Diagnostic Screening Manual (DSM IV). This scale was created by Naomi Breslau and her research team in 1999, based on practical PTSD cases. Do you avoid reminders of an experience by staying away from places, people or activities? Have you lost interest in activities that were once important or enjoyable? Have you begun to feel more distant or isolated from other people? Do you find it hard to feel love or affection for other people? Have you begun to feel that there is no point in planning for the future? Have you had more trouble than usual falling or staying asleep? Do you become jumpy or easily startled by ordinary noise or movements? If you answered yes to 4 or more of these questions, talk to your GP about PTSD. If medically diagnosed with PTSD; strictly follow your GP’s instructions. Treatment and recovery take time and everyone is different but through small changes you can slowly experience big improvements. So try to have a strong support network through family and friends, reduce stress and begin living a healthier, active lifestyle. *Please note this screening measure is not 100% accurate, so professional medical advice is needed for diagnosis. Need to refresh your mind on Post Traumatic Stress Disorder? Here are some fast facts! Post Traumatic Stress Disorder can occur as a result of experiencing trauma. Traumatic events include physical or sexual assault, war or torture, disasters, car or other serious accidents. Although not everyone develops PTSD after experiencing a traumatic event, women are more likely to develop PTSD than men and certain jobs have higher risk of developing PTSD due to increased exposure to traumatic events. According to the Australian Bureau of Statistics, 1.4 million Australians at any one time have Post Traumatic Stress Disorder. This means 6.4% of all Australians have PTSD, yet the number could be higher as many Australian’s go undiagnosed due to denial of having the disorder, and the difficulty of diagnoses. What are the symptoms of PTSD? Intrusive thoughts can be experienced via flashbacks, or reoccurring pain. It can also manifest in dreams, that can lead to insomnia or sleep disturbance. People living with PTSD will typically avoid smells, tastes, touch or any sensation that reminds them of the traumatic event they experienced. As a result, people with PTSD may avoid people (such as friends, family and colleagues), and places (such as work or home) as a coping mechanism to stop reliving traumatic memories. This can cause them to feel detached from people, to lose interest in activities they once enjoyed, and feel that their future is bleak. This avoidance behaviour can also lead to the person experiencing emotional numbing. Panic attacks are often experienced by people living with PTSD. This wound up state that people living with PTSD experience, can cause anger and irritability. Additionally, prolonged stress can cause memory and concentration problems.